As with theatre performances of plays, there are many different aspects of storytelling. I’m exploring in this post the theatre of storytelling and how the lines of theatre and storytelling cross each other, blur and stand apart. I’ve always loved the theatre – visiting it and being a part of it. For me, it’s so thrilling to see a live performance of a story unfold before your very eyes. My dad used to take us to theatres regularly and as part of my Drama degree, it was compulsive to see as many theatre performances as possible. Another love for me, is the range of theatre available to us here in London and across the UK – I could quite happily watch new talent within the intimate setting and minimal set design of a fringe theatre like The King’s Head Theatre, set above a pub; or a large scale production, perhaps set in the round with lavish backdrops and technical apparatus at somewhere like The National Theatre. Storytellers are increasingly becoming part of the theatre offering which is wonderful. So what sets storytelling apart from acting out a play on a stage? 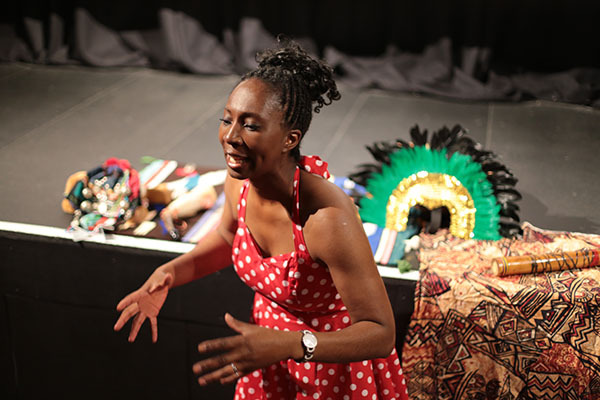 My style of storytelling is traditional oral storytelling where I tell a tale from memory, using cultural references and opportunities for the audience to participate like ‘call and response’. 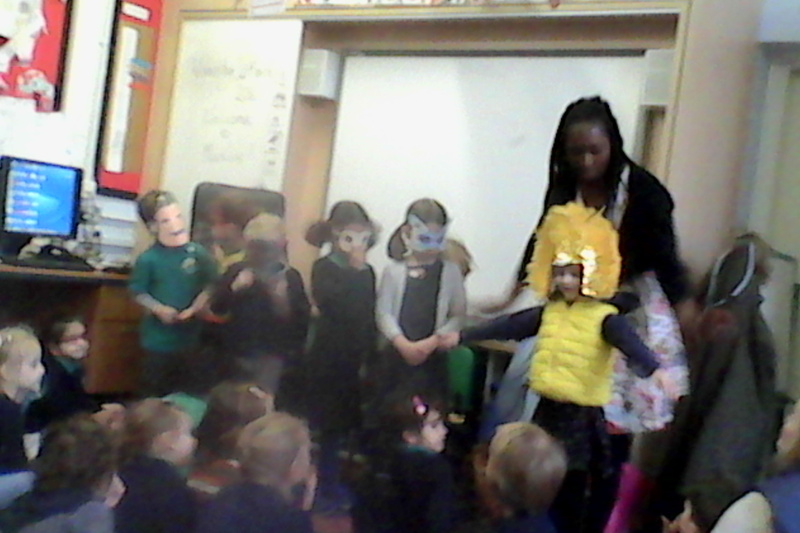 With children I sometimes use drama and invite them to take on the role of a character whilst I tell the story. Other times, I’ll use small props for symbolism, visual aid or for someone to participate with in the tale. This for me is where there can be blurred lines with theatre and storytelling. I tell stories in theatres, art houses and cultural venues mostly for family fun days and events. The props, music and instruments can enhance the performance of storytelling or as I like to say the ‘theatre of storytelling’. Some brilliant storytellers incorporate amazing masks like Pyn Stockman, costumes like Xanthe Gresham Knight, instruments like Vanessa Woolf and Sally Pomme Clayton. When storytelling, rather than tell the tale to a silent, observing audience, we storytellers encourage you to react. It’s not like watching a play. The audience can become part of the story, even shape and illustrate it at times. During a workshop led by renowned storyteller and performer Jan Blake, she told us that the storyteller is the ‘narrator’. We are letting the audience in on what we have witnessed. This for me is the magic of storytelling and where it stands apart from theatre. Storytellers invite you into the tale where you can physically inhabit the space through the storyteller’s eyes. During an intensive week’s workshop with Peter Fruhmann from Story Bag, he guided us to think about what role the listener plays during our storytelling. It was fascinating exploration, the notion that in the theatre of storytelling, both the storyteller and the audience play a role.